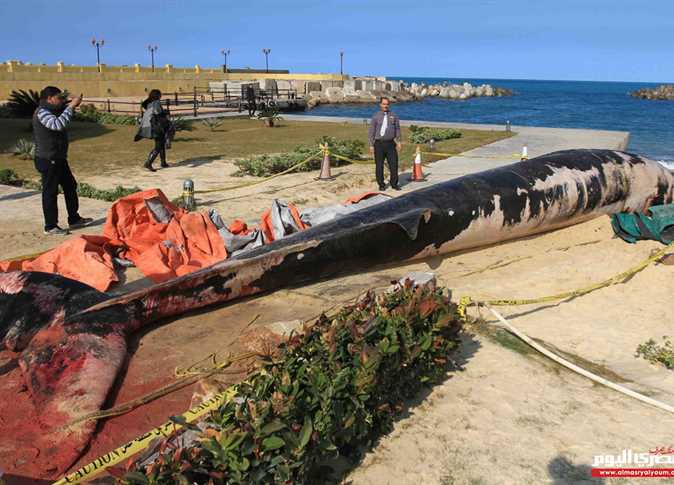 The Environment Minister, Khaled Fahmy, said that the beached fin whale which appeared on Alexandria’s shores on Sunday may have committed suicide. In Sunday’s phone-in with the ‘Yahdoth Fe Masr’ (Happening in Egypt) talkshow on the MBC Masr channel, Fahmy said that the whale may have committed suicide, a bizarre phenomenon which occurs for unknown reasons among whales. He added, however, that there may be another explanation. The waves may have stranded the whale, pulling her away from her swarm and throwing her into a shallow section of the shore, her unable to get out. The whale’s body did not reveal any deep wounds, he added. Fahmy pointed out that this whale is the second largest species of whale in the world. Her age was 7 to 8-years-old, she was female, and she died in the last 24 hours. For his part, the head of the Environmental Affairs Agency Shehab Abdel Wahab said that the whale will be buried in the landfill waste disposal site of el-Max. He explained the whale will be transferred to the burial site in el-Max to bury it scientifically, where it is placed under layers of lime and plastic waiting for decomposition after 7 months to obtain the skeleton for use in research.